Is this the moment the Rebellion steals the Death Star plans in Rogue One? Earlier today at the Star Wars Celebration in Europe, new footage for Rogue One: A Star Wars Story was shown off. But instead of a typical trailer, fans got a look at an extended sizzle reel of behind-the-scenes footage. It was a great look at what makes Rogue One different from the other Star Wars movies and how director Gareth Edwards is using his more frenetic style to tell a more immersive, war-like movie. 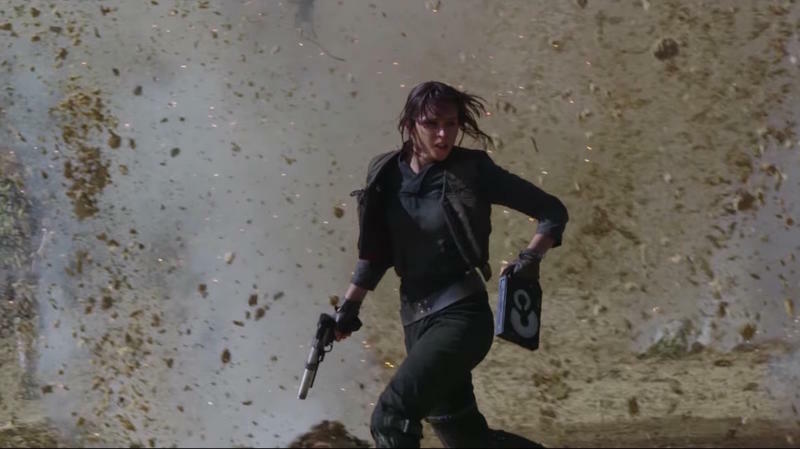 About halfway through the footage, there comes a scene showing Jyn Erso (Felicity Jones) and Cassian Andor (Diego Luna) running across a sandy beach full of chaos and explosions. It looks a lot like the scene we saw in the teaser trailer that was released earlier this year, just from a different perspective. But wait, what’s that in Jyn’s hand? If you look close, she can be seen holding onto something while all hell rains down around her. What can be so important that she doesn’t just drop it and run? Could it be the stolen plans for the Death Star? We’re just speculating here—it seems odd for the footage to reveal such a pivotal moment—but what else could it be? With the Death Star looming over Scariff in the new Rogue One poster, it suggests the moon-sized base was being built in the planet’s orbit. Why else would these AT-ACTs be needed? We don’t want to put too much stock in the poster—remember the debacle surrounding the Return of the Jedi poster? But it sure seems like Scariff is going to be immensely important not only because it’s where a huge battle takes place, but it’s possibly where Jyn Erso and her team steal the Death Star plans. In addition, the behind-the-scenes footage also shows Director Krennic in a spaceship overlooking an unknown planet. Although it’s difficult to see, it sure looks like there’s plenty of greenery and water, suggesting he could be overlooking Scariff; there comes a point in the first teaser trailer when we see him walking across the beach, seemingly after the big battle on Scariff takes place. He acts as director for the Imperial’s Advanced Weapons Research division, and he’s apparently obsessed with finishing the Death Star. How mad is he going to be when he finds out the plans were stolen? Scariff could very well be where this “hidden base” is located. Again, this is purely speculation but we thought we’d point it out. Not only does Scariff look like one of the most beautiful locations in the galaxy, but it might possibly hold plans for one of the franchise’s most iconic weapons.